The De Ruyter was the first large warship to be built by the European Nations in their effort to stay even with the United States. Design of this class of ships was begun after it became clear that the US had started work on a large space warship. Because it was clear that the United States was much further ahead with their program, the decision was made to build smaller, and somewhat faster to build ships. A consortium of several companies were formed to build the ship, most notably Airbus and Dasa for the Frame, Phillips and Thomson for the avionics and weapons guidance and, somewhat surprisingly (having nearly gone bankrupt the year before), Rolls Royce for the engines. The main armor was supplied by Krupps. Weaponry came from Giat and (having expanded into heavy weaponry in the early years of the new century) Heckler & Koch. Dozens of other subcontractors also added to the logistical nightmare. Many of these companies would eventually be absorbed into what would become TRIAX in later years. In true European fashion the name of the class was the subject of some extremely heated debate among the member states. Finally the name was decided by fate: every member state gave a name, some (Like France and Belgium) gave the same name. Among the names submitted were Nelson, Foch, Bismarck and De Ruyter. A name would then be randomly drawn, and this name would grace the class of ships and the first of the class. To the intense chagrin of French and British alike the name chosen was that of the Dutch admiral Michiel De Ruyter. The British especially protested the choice, saying that they did not agree with the name of a man who had once defeated them by sailing up the Thames and burning the British fleet in its harbor! Upon hearing this, the French dropped all protests against the name... De Ruyter it was. The ship is propelled by seven pulse fusion engines. This allows for both fast accelerations and for long distance operations. The engine uses reaction mass in the form of deuterium and helium 3. Most of the fuel is carried in a frozen form to increase the storage ability of the ship. This gives the ship a five month endurance. The ship is very well armed. For the ships main non missile weaponry, it has four heavy Plasma cannon forward. These cannon take their plasma directly from the ships main fusion reactor and are immensely powerful as a result. 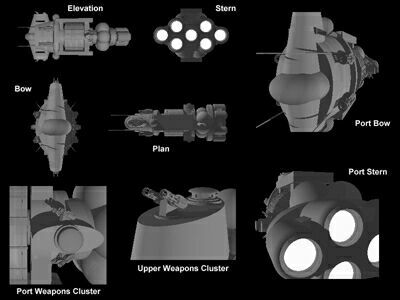 The De Ruyter has 6 double laser turrets for both support of the plasma cannons and to be used against fighters, power armors, and missiles. The ship also has eight automated railgun close in weapon systems that normally act as the ships point defense but can be designated on other targets if needed. The ship carries four long range missile launchers for both anti-ship and anti-fighter use. The ship also has an automated mini-missile launching system that is used as inner anti-missile point defense. The ship has only a radar jamming system for ECM, because of European stealth technology lagging behind that of the US. The computer systems are designed with double hardened systems to prevent either jamming or EMP from damaging the ships system or any systems of equipment inside the ship. The ship has no force field, but it carries a special kind of ablative armor on several of the more important systems. This armor receives only half damage from lasers and particle beams, but receives full damage from kinetic energy weapons like railguns. The ship also carries four defensive chaff launchers. The radar system on the ship is very sophisticated and uses four domes all equipped with phased array systems. This system is used for both tracking and fire control. The systems partially cover each other so the loss of one dome will only cause minimal loss of tracking and targeting. The domes are located close to the double laser cannons. A Magnetic force field generator was also installed, but during the shakedown cruise it became apparent that the system was malfunctioning beyond the capabilities of the engineering crew to repair. Before the ship could return to the orbital shipyard the Flash came, and the De Ruyter is currently without functioning shield generator. Even though they are now working together with the USSF, this has not helped, as the design for the USSF shield generator is radically different in execution than that of the ESDF design. Their spare parts will not fit and to fit a modified version of the American system would mean putting the ship in a shipyard for a year while the whole system gets changed out. Maybe the parts needed can be found at one of the Orbital colonies, but none knows for sure. This ship is not laid down like a traditional ship. All sections except rotating crew sections have the floors towards the rear of the ship. This means that while the ship is accelerating or decelerating (The ship simply flips to decelerate) the crew have the comfort of the appearance of some gravity and the forces of acceleration will not be striking the crew members sideways. This means the crew can do most jobs at full efficiency though some jobs would seem to be done sideways when compared to traditional naval ships. The control center is also laid out in a novel way to take advantage of the ship’s design. The ship is also equipped with a rotating section which provides the crew with a 1 G environment. This section rotates around the central hub. In order to protect the most vital machinery of the ship, both life support and the main fusion reactor are located inside the hub which is very thick compared to other designs. It means that the entire rotating section acts as armor for several important systems. However, this means that there is little room in the rotating section. Inside this section are crew quarters and exercise areas. Entrance to this section is made through the central hub area. The rotating section is kept rotating in the same way an electric motor spins in basic principle. The system is free floating and requires little power to continue to spin. It is sealed of from space by using magnetic fluids which permanently seal the gap between hub and rotating sector. The ship has a hydroponic section to extend the ships supplies and to help augment the life support. Special plants have been engineered for the hydroponic section that provide all the nutritional needs of the crew but the hydroponics section does not grow enough food so that the ship must carry food supplies as well. The ship does carry power armors, but these are mostly for shipboard defense. The ship was classified as a Destroyer and it pretty much is one too. Because of the large number of powerful weapons it has no room left for fighters and only a few shuttles. It does carries space assault troops (All were specially trained British SAS members). The ship is equipped two hanger bays that each normally carry 4 shuttles each but can maintain up to 6 allowing one hanger bay to take up some of the slack of the other hanger bay. The hanger bays are long sections that extend over and under the rotating section. The Hangar bays have large doors that open upwards and downwards. When the hanger bay is not being used for flight operations, it is pressurized and all doors are closed. When the hanger bay is being used for flight operations, the hanger bay is a vacuum and airlocks prevent air loss from the rest of the ship. Shuttles land by approaching the hangar bay from above. They are then pulled in by special manipulator arms that pull the shuttles into their berths. Launching is essentially the reverse of this procedure. The manipulator arms can also be used to retrieve damaged shuttles and other items. Because the revised starship rules may not be desirable by all groups, vehicle statistics have been listed in standard Rifts levels as well. Using standard Rifts level, the starship’s performance is only a fraction of listed performances for the revised writeup. Depleting the M.D.C. of the main body will put the Destroyer out of commission. All internal systems will shut down, including life support. Rotational crew section will stop rotating. The ship itself will be an unsalvageable floating wreck. In reality this is how much damage needs to be done for a weapon to hit the control center through the ships armor. This ship does not have an auxiliary control center. Even if the control center is destroyed, the ship can still be piloted from engineering but the ship is -3 to dodge and all weapon systems will be at local control. Weapon hits near the bridge that do not penetrate the ships integrity can injure crew members on or near the bridge. The destruction of one sensor dome will cause a 20% reduction in sensor effectiveness. The destruction of two sensor domes will cause a 40% reduction in sensor effectiveness. The destruction of three sensor domes will cause a 80% reduction in sensor effectiveness. The destruction of all four sensor domes will effectively blind the ship except using fire control systems as sensors. If the M.D.C. of the Rotating Crew Section is reduced to less than half, the crew section will lose power to the rotational system. The rotating crew section will slow down at the rate of 10% of its speed for every hour that the power is out for rotating the Rotational Crew System. In 10 hours, the rotation will completely stop. Extra note: the Ablative armor added to certain sections of the ship takes only half damage from lasers and particle beams, but full damage from all other attacks. There is no one in the Orbital Community capable of manufacturing this armor on such a scale, so when its gone, its gone! Space Propulsion: The starship does not have an effective top speed but is limited by acceleration. The Destroyer can reach a top acceleration of 4 G but due to high fuel consumption and extra strain on the engines, the ship will normally travel at 0.5 G for any extended trips. Top acceleration is only meant for emergencies and combat maneuvers. Because the Destroyer is mostly unshielded from the effects of radiation and hypervelocity atomic particles (It is not completely unshielded), the Destroyer is not operated at speeds exceeding 20% of the speed of light. [ For gamers who do not wish to use revised rules, assume the ship’s engine is combination of a plasma drive with a top speed of Mach 9 and a traction drive. Note: If consider the ship this way, the ship cannot operate fighters or power armors at high traction drive speeds]. Planet Bound: The ship cannot operate within an atmosphere and if the ship was to ever enter an atmosphere, the ship would crash into the planet. Maximum Range: Conditionally unlimited, while the fusion reactor gives power for over two decades of service, the ship’s propulsion is limited by the ships reaction mass. The reaction mass consists of mainly Deuterium (Hydrogen 2) and Helium 3. The ship can be refueled at ground based (asteroid) facilities, space stations, and other star ships as long as they have the special facilities. The ship can also be refueled by fuel shuttles. The destroyer carries 6 month of reaction mass for travel at 0.5 G of acceleration. Double the consumption of fuel for 1 G of acceleration and double the consumption again for every 1 G of acceleration beyond 1 G. this means the ship will burn the fuel 16 times faster at maximum thrust than at 0.5 G of acceleration. The ship will often accelerate for a period of time and then shut down the engine and travel using the ship’s velocity. If the ship uses more than half of its reaction mass when accelerating, the ship will be unable to decelerate fully and the ship will normally only use a third or less of its fuel on accelerating so it does not run into a problem. If the ship runs out of fuel then it must be refueled by another vehicle traveling faster or be lost. The ship has a hydroponic section and with ships stores and the hydroponic ship is capable of operating for sixteen months without resupply. Main Engine: The Ship is powered by fusion reactors that will theoretically operate for 15 years and can provide effectively unlimited electrical power. However, it was recommended that the drive and power system have routine maintenance every 5 years. Also, the ship only carries about a six month supply of reaction mass. Cargo: Ship has six small cargo holds that are each 18 x 18 x 20 feet (5.4 x 5.4 x 6 meter) in dimensions. The ship has a total of 38,880 cubic feet (1,050 cubic meters). Each enlisted crew member has a small locker for personal items and uniforms. Ships officers have more space for personal items. Most of the ship’s spaces are taken up by extra ammo, armor, troops, weapons, engine, reaction mass, equipment, and hydroponics. Cost: Any station in orbit would spend billions of IOU to purchase this ship. Maximum Effective Range: 140 miles (224 km) in space and 7 miles (11.2 km) if fired into an atmosphere [Non revised rules, cut space ranges by 3/4]. Rate of Fire: Equal to gunners hand to hand (Usually 4 or 5). Eight (8) Rail Gun CIWS: Automated close in weapon system which is used as a last line of defense against missiles and starfighters. It is both radar and infrared guided and has a +5 to hit . It can be fired manually, but normally it is set on automatic. The high hit probability stems from the fact that the same software is used as in the Meteor railguns of the Space Predator. The software automatically lets the gun disperse its burst in a pattern which is most likely to hit versus a target of a given size at a given range. The railgun in each CIWS fires 1 cm projectiles. Mega-Damage: 1D4x10+10 for a 100 round burst. No single shots. Rate of Fire: automated 6 times per melee OR gunners hand to hand(Usually 4 or 5). Payload: 8000 rounds per gun for 80 bursts. Four (4) Long Range Missile batteries: Two of these launchers are mounted on the top of the ship, and two of the launchers are mounted on the bottom of the ship, all in the front part of the ship. These launchers are both used to launch anti-ship strikes and to launch against starfighters. Missiles are assumed to accelerate at 2 times normal mach speed in Gs greater than the starships speed when used in space. Missiles can be launched at non moving targets beyond the powered range of the missiles to hit targets without the chance of the launching ship being hit by missiles itself. Each of these launchers can be targeted and fired at multiple targets. The missiles normally used are Smart Missiles. Maximum Effective Range: Varies with missile type, long range missiles (See revised bomb and missile tables for details - Powered range is x 8 in space). Rate of Fire: Can fire missiles one at a time, or volleys of two (2), four (4), or eight (8) missiles per launcher (64 total). Four (4) Anti-Missile Mini Missile Launchers: One of these launchers is located on top of the ship, another on the bottom, and one on each side. The system is an automated system that launches twelve fragmentation or plasma mini missiles at a volley of enemy missiles. If the volley is tightly clustered, then the mini missile will automatically destroy the volley, but if the volley is widely separated, then the mini missile will target two mini missiles at each incoming missile and will target up six incoming missiles per launcher. Each system has 6 individual laser targeting systems to guide missiles. Missiles are assumed to accelerate at 2 times normal mach speed in Gs greater than the starships speed when used in space. Four (4) Chaff Throwers: This system launches clouds of chaff around the ship. The chaff are canisters of thousands of small highly reflective aluminum strips. The chaff will remain around the ship for a period of time unless the ship accelerates, decelerates, or changes course which will take ship out of the chaff cloud within one melee. All launchers must launch or ship will only have partial effects. Each reduction of a launcher will reduce effects by 25%. Rifts Earth and Mutants In Orbit decoys systems are assumed to not operate on Phase World missiles due to technological difference. Mega-Damage: any vehicle flying through take 2D6 M.D.C.
As long as the ship does not accelerates, decelerates, or changes course the chaff will take five melees to disburse. If the ship accelerates, decelerates, or changes course, the ship will leave the chaff cloud in one melee. Payload: 200 Cylinders of chaff (50 per launcher). Hardened Circuitry and Electromagnetic Shielding: All electronics and computers on the destroyer are constructed with hardened circuitry and the ship itself is built with shielding to prevent EMP and jamming from damaging circuitry. The effect is that jamming and EMP will not damage any system while it can blind the ships radar and radio communication system. Laser systems will not be effected by jamming. Jamming System: This system scrambles all electronic signals for a range of 6,000 miles (9,624 km)miles in space and will penetrate an atmosphere for a distance of 60 miles (96.24 km). The system can also confuse missiles. It has a 45% chance of confusing missiles but some missiles can home on jamming signals. Phased Array Radar System: This system was developed from the APAR system that was used on many European naval vessels. Powerful and flexible radar system that is comprised of four panels that each emit radar waves. The systems radar sensors are located in four domes on the ship and are used for both tracking and fire control. The radar system can cut through Rifts Earth and Mutants in Orbit jamming systems at one quarter of the systems normal range allowing the system to work well against targets that are jamming. The system has a range of 80,000 miles (128,700 km) in space. and can penetrate the atmosphere up to 800 miles (1,287 km). The system can track and identify 4096 targets at on time. Can also target each individual missile to a separate target at up to 1024 targets. Neutrino Sensor: All fusion and fission reactors output neutrinos (So do stars and anti-matter systems as well). The ship uses a specialized magnetic field to capture and focus neutrinos into a sensor designed to detect neutrinos. The system also eliminates neutrinos from the sun although it is impossible to detect a target if the target is between the sensor system and the sun due to the overloading the ability of the system to detect neutrinos. The Neutrino sensor has a range of 90 miles (144 km) penetration of an atmosphere and has a range of 9,000 miles (14,400 km) in space. The sensor has a 30% chance of being able to be able to differentiate between fusion and fission reactors. Revisions by Kitsune (E-Mail Kitsune). Copyright © 1998 & 2001, Mischa. All rights reserved.